Use only the orange petals. Be careful to remove all green portions of stem. Wash the petals to remove any bugs, dirt and dust. Bring water to a boil and stir in sugar until dissolved. 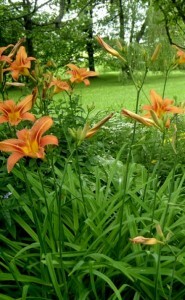 Remove from heat and quickly pour over daylily petals in primary container. Cover the primary container and set aside for five minutes. Add remaining water and apple juice concentrate to cool the must(i.e. daylily petals and water and sugar). Stir in the activated yeast and the remaining ingredients, cover, and put in a warm place for five days, stirring gently each day. If you put petals in a wine sock ,then at the end of the five days all you need to do is squeeze the wine sock to get out all juice. If you don’t use a wine sock then simply strain and discard petals. Rack into a 5-gallon carboy and allow to ferment and mature.Once the liquid has stopped bubbling you can bottle. It is drinkable once bottled but if left to mature a little, tastes even better. Can be back sweetened if desired. Wash and drain well . Add enough beer, soda water or other carbonated beverage you choose to mix the batter to a good consistency. Not too thick and not too thin. You want the batter to coat the daylily buds when you dip them in the batter. While mixing batter turn on pan in which you will deep fry the buds. Use about 2 cups of grapeseed oil or other non GMO based oil. Batter your buds and fry for about a minute in hot fat , then turn and fry for another minute …..till buds are crispy. Remove from fat and drain on paper towel covered plate. Serve with your favourite dipping sauce.